As I said in my review of Snowpiercer, I’m going to look back on films that came out earlier in the year that I never got around to. Nightcrawler came out on Halloween of this year, but I never really had any time to see the film (I’ll explain why several months from now). 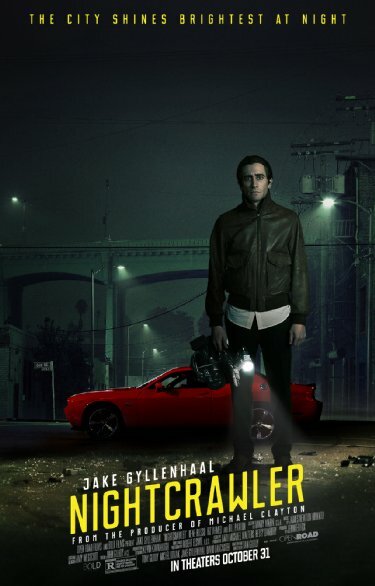 I had wanted to see Nightcrawler ever since the film started to receive some buzz from its premiere at the Toronto International Film Festival earlier this year, with many singling out Jake Gyllenhaal’s performance in the film as one of the finest this year. Hot off the news that Gyllenhaal received a Golden Globe nomination for his work in this film, my local theater has decided to start playing Nightcrawler again. I was able to find some time this weekend to go see the film in an empty theater (no rude people, just myself and two other people by themselves). So I’ve just seen Nightcrawler, and let’s get on with the review then. Gyllenhaal plays Louis Bloom, a gaunt looking individual who lurks around the streets of Los Angeles at night. One night, he sees a car that’s on fire off of the highway, and meets Bill Paxton, who is a freelance videographer who sells local news stations footage of accidents and crimes of similar nature. “If it bleeds, it leads” is what he tells Louis. Louis decides to go buy himself a camera and begins nightcrawling around Los Angeles each night, looking for the best kind of news that he sells to a local news station and its news director, played by Rene Russo. As the film progresses, we see that Louis will do whatever it takes to get the first footage of certain crime scenes, even before the police show up to the scene of the crime, and you begin to question Louis’ mental (as well as his physical) well-being. Nightcrawler was written and directed by Dan Gilroy, who is the brother of writer Tony Gilroy and editor John Gilroy. Dan, who also happens to be married to Rene Russo, is making his directorial debut with this film, after years of co-writing several Hollywood films. What got me a little excited in seeing the film is that it’s a neo-noir, a genre that I’m extremely fond of, and its a neo-noir with Los Angeles as the backdrop. Los Angeles of course has been home to some of the best neo-noir classics of all time, with examples being Chinatown, L.A. Confidential, and 2011’s Drive. Even though both films are substantially different from another, I kept finding similarities between Drive and Nightcrawler. Maybe because both plots revolve around a loner in modern-day Los Angeles who may be a lot more that what people think he is. Drive is a little cooler and more of a classic feeling film, while Nightcrawler is still very slick and cool, it feels a little more unsettling and tense. This is all because of Jake Gyllenhaal’s magnificent performance in the film as Curtis. Gyllenhaal lost 20 pounds to play this character, and Gyllenhaal is practically unrecognizable in the lead. He’s a man who seems to know a lot about the world, and he immediately gets educated on the world of nightcrawling, but he will do whatever it takes to get what he wants. Even if it’s a bit illegal. The film is always a little unsettling because Curtis has this creepy demeanor with his slicked back long hair that makes you think that he’s not in the best mindset. And Gyllenhaal is in every scene of the movie, so you get to see this very dark and mysterious character study play out during the films near two-hour time run time. It’s fascinating, nearly every frame of this film, just to watch Gyllenhaal disappear into this character, and it’s easily the best performance of Gyllenhaal’s career. It’s also great to see Rene Russo back in movies after a bit of a hiatus for a few years. She’s really terrific here as the news director that is very career driven and will do whatever it takes to get ratings in the local news market, no matter how low or high the stories are. The film is very realistic in the way that it presents the way in how local news does many of these gruesome stories. I usually don’t see stories that are as gruesome and depressing in Austin, but whenever I’m cities with a bigger market, like Houston, Los Angeles, and even Albuquerque to an extent, many of their stories are pretty shocking. I liked the social commentary on that issue, as it’s all mixed in with this methodically thought out character study of Gyllenhaal’s character. Bill Paxton, with the little screen time he’s given, is great as always. Riz Ahmed also does some fine work here as Gyllenhaal’s protege and assistant in the pursuit for stories. To sum it up, Nightcrawler is a really terrific neo-noir film, and it doesn’t hurt that it features what is arguably the best performance by a lead actor this year. I’m really happy that Gyllenhaal has been recognized by both the SAG and Globes for his performance, and while it’s probably a long shot to say that he’ll win, I wouldn’t complain if he did. But I still haven’t seen Foxcatcher yet (comes out next week in Austin) so I could change my mind then. If Nightcrawler is still showing in your area, I highly recommend that you go see the film if you haven’t already seen some of the other great fall movies of this year. December 14, 2014 in 2014 Film Reviews, Movie Reviews.